After retirement, Dr. Meier has been founder, Chairman or member of the Board of Directors of several venture capital companies, funds and foundations. Previously, he was member of the Roche Group Executive Committee and its Strategy Committee and for over 16 years Chief Financial Officer of the Roche group, and for 12 years a member of its Board. 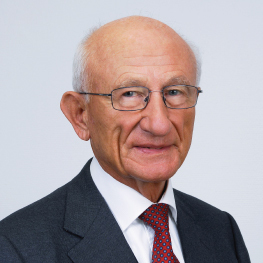 He also was founding Chairman of the Board of Directors of Givaudan AG as well as member of the Board of Directors of several Swiss Corporations. Before joining Roche, he was a member of the Executive Committee of Handelsbank National Westminster, responsible for the development of investment banking operations, member of the Executive Committee of Motor Columbus Ing. and Division Chief at the World Bank in Washington. Dr. Meier holds a master’s and a doctor’s degree in business administration and economics from the University of St. Gallen; he also did post-graduate studies at Columbia University in New York. In 1999, the University of Basel awarded him the title of an honorary PhD, and in 2011, the University of St. Gallen awarded him the title of “Ehrensenator”. Dr. Meier has written several books and articles in the field of capital markets and currencies.